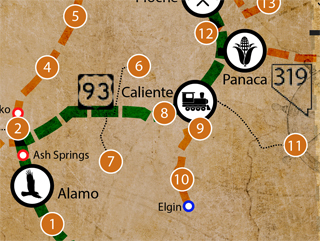 The Shooting Gallery Game Drive District lies in Curtis Canyon, about 8 miles west of Alamo. The Shooting Gallery gets its name from evidence at this location that prehistoric inhabitants had created hunting blinds and a system of rock arrangements to channel herds of large game towards hunters. 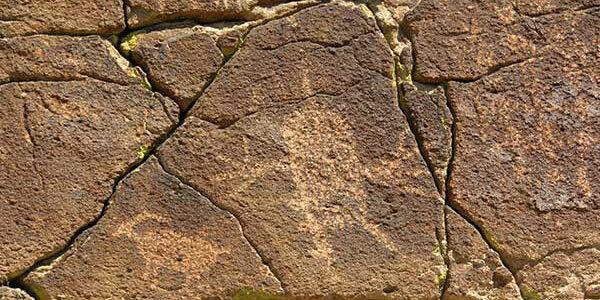 There is no formal trail system established, so walk carefully to avoid stepping on any rock art. Looking up from the valley floor you might see rock piles along the hilltops. These are thought to have been made by early hunters to scare Desert Bighorn Sheep, fleeing up the slopes, back down towards the hunting blinds. Instinctively, Bighorn Sheep will escape danger by quickly climbing steep slopes. The rock piles and upright rocks could have looked like hunters standing in their escape path. This unique combination of a narrow valley, seasonally abundant water, and a good grazing area for sheep and deer is what makes the Shooting Gallery one of the few known game drives sites in central and southern Nevada. Archeologists who study this area, suspect that it had been inhabited by several different groups from 500 to 2,000 years ago. Ongoing research could lead to evidence of even earlier cultures living and hunting in this valley. 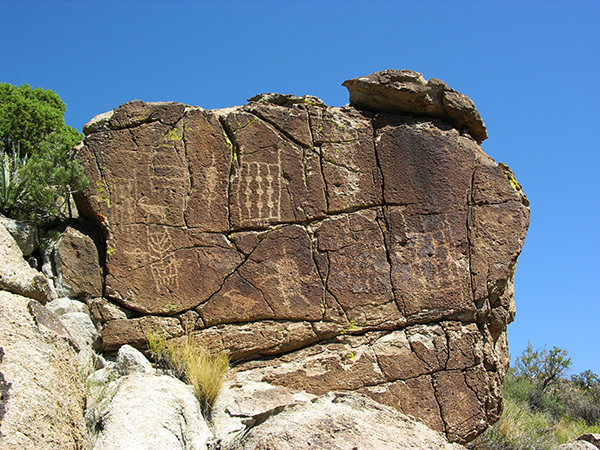 The rock art at Shooting Gallery are representative of the three distinct styles found within the Pahranagat Valley: The Great Basin Abstract Style, that is predominately abstract symbols (circles, grids, etc,); the Pahranagat Representational Style (bighorn sheep, deer and anthromorphs – human-like characters with rectangular bodies and solidly pecked out bodies and heads); and the Fremont Representational Style, that resembles the classic trapezoidal bodied Anthromorphs and Quadrapeds. North Richardville Road, which leads to the entrance ofShooting Gallery Game Drive District, is approximately 9.1 miles from the intersection of State Route 375, State Route 318 and U.S. Route 93 (the “Y”). Traveling south on U.S. Route 93 towards Alamo, North Richardville Road is on the right (west) side of the road just before Windmill Ridge. Follow North Richardville Road to Canyon Road, and turn west. The paved section of Canyon Road ends at .3 miles. Approximately .1 mile from the end of the pavement, take a right at the fork in the road (there is a “dump site” sign to the left.) Follow the main road, despite various branches. At approx. 5.3 miles there is a gate. If it is open, leave it open; if it is closed, open it, drive through, then close it (cattle grazing). At 5.7 miles, turn left and ascend a steep, winding road (note: lowest gear, 4×4 advised from this point on). At 6.6 miles, stay to the right. At 7.1 miles, stay to the right through the valley. At 8.7 miles, there is an extreme right-hand turn on to a narrower road. This road will end at 9.0 miles where there is a parking area and register. From here, follow the path north down the wash, approximately 3/4 mile to a boulder field on the west side of the canyon.